Manchester United and the rest of the Premier League's chasing pack will find it difficult to stop Manchester City next season if Pep Guardiola is given more funds to strengthen his side, according to Jose Mourinho. City won the title with five games to spare this term, having benefited from the signings of Kyle Walker, Ederson and Bernardo Silva, as well as the January capture of Aymeric Laporte. Another significant acquisition, wing-back Benjamin Mendy, made his comeback on Sunday after being sidelined since September due to a serious knee injury. That investment from the club's Abu Dhabi owners has helped Guardiola orchestrate a dominant march to the title with United second, three points ahead of third-placed Liverpool with a game in hand but a distant 16 points back from City. 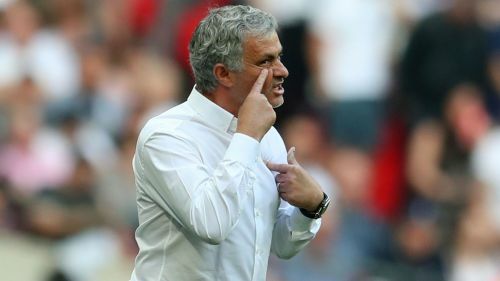 Speaking after his team's 2-1 FA Cup semi-final victory against Tottenham at Wembley on Saturday, Mourinho expressed his concern over the potential for City to tighten their stranglehold at the top, should further reinforcements arrive at the Etihad Stadium. He said: "Can we improve next season? Let's try. Can Man City keep this level and improve this level? Only they can say. "But if they have the team they have and are going to invest in the team they have, of course it is going to be very difficult for all of us." United have also made significant outlays in recent years to bring in the likes of Romelu Lukaku, Paul Pogba and Alexis Sanchez, Mourinho hinting the club could pursue a more conservative approach in the transfer market ahead of the 2018-19 campaign. "We are going to invest the basic [amount required] to improve our squad – find a replacement for Michael Carrick, if Marouane Fellaini leaves we are going to need a replacement for Marouane Fellaini," he added. "In a squad there are always a couple of players who are not playing a lot and they will try to leave. "So we are going to touch our squad again and believe in more than spend, spend, spend. It is probably about the evolution of our players. "We have some young players. They need to catch opportunities for their evolution with both hands and let's see." Despite outlining his expectations for United's off-season recruitment, the Portuguese was adamant the team's focus must be on their next Premier League clash at home to Arsenal on Sunday, as the Red Devils seek to secure the runner-up berth behind City. "In this moment I don't think about next season or the [FA Cup] final," he said. "I think about Arsenal because we need one point to finish in the top four but we need seven to finish second. "We deserve to finish second and we have to finish second." Premier League 2018-19: Manchester City are in uncharted territory, but are they setting the best example for success?